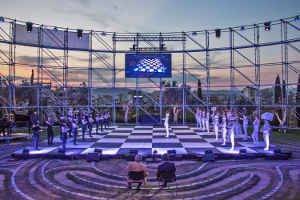 The Summer Nostos Festival at the Stavros Niarchos Foundation Cultural Centre (SNFCC) in Athens, Greece, is an arts, sports and education festival that is open to the public free of charge. Music, dance, sports, arts and architecture discussions, film and video screenings and programs for children and families are combined for an entire week in June as part of a multi-faceted program of events for all ages. The Stavros Niarchos Foundation returned in 2018 for the fourth consecutive summer — as the host, organizer and exclusive supporter —to the “home” it created. The Summer Nostos Festival encapsulates the idea of “nostos” (homecoming), the inexhaustible desire to return to all things familiar including emotions and places. Lighting designer George Tellos of Lighting Art was relying on MA Lighting for his design and used 1 x grandMA2 full-size with 3 x grandMA2 light, 2 x MA NPU (Network Processing Unit) and 3 x MA NSP (Network Signal Processors) for control. Panos Tsevrenis (Lighting Art) worked as lighting programmer. The production was realized by ViewMaster Films. Costas Charalambides was the technical director, Yannis Zarganis the producer. Nick Charalambides worked as head of video while Eugine Tzafestas was the lighting director and Irene Samartzi the lighting coordinator. PRG XL Video, Germany, and United Technical Group, Greece, provided the lighting equipment. Bon Studio S.A. is the exclusive distributor of MA Lighting in Greece. NLD: Don’t Let Daddy Know About Robe!